Immerse yourself in the wonders of New York State, one of East Coast America’s most exciting destinations. From food and beer trails to white water rafting, New York State, outside of New York City offers so much to all who visit. And the best way to explore this fantastic destination is on a fly/drive holiday that takes it all in. Hudson Valley is one of the most scenic places to visit in New York State and its treasure trove of hiking trails, restaurants, award winning wineries and museums. Home to both Woodbury Common Premium Outlets and fantastic attractions such as the Walkway over the Hudson, your time in Hudson Valley will be jam-packed with fun. 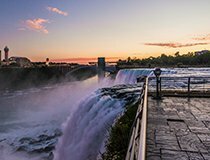 The Greater Niagara region of New York State offers so much to all who visit. Not only is it home to the incredible Niagara Falls, the magnificent Letchworth Gorge is also located in the area as are many wine trails and opportunities to enjoy nature. Long Island, which is just a couple of minutes from Manhattan is the perfect East Coast beach destination. Divided into four travel regions, the area boasts world-famous beaches, opulent estates, picturesque harbour side villages and loads for families to enjoy. The world famous regions of The Hamptons and Montauk are both located in Long Island. Catskills New York is all about exploring the great outdoors. With a mountainous setting, Catskills is perfect for adventure seekers. Bike along its many trails or hike to new heights on its mountains. A trip to Catskills is all about finding and enjoying the beauty of the great outdoors. The Capital – Saratoga region is famous for its tranquil woodlands, lakes and farms as well as its performing arts. Home to Ballet, rock and jazz concerts and some of the world’s best racing, Capital – Saratoga is a gem with so much to enjoy. Another highlight of the area is the New York State Museum, a must see on your visit. New York State is the perfect destination for every type of traveller. 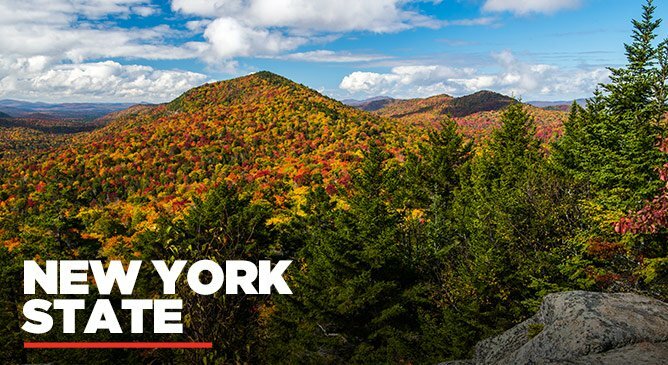 Whether you’re looking for hidden gems, excellent shopping or world-renowned food, New York State has it all and it’s the perfect destination to expand your horizons! Horseback riding, shopping and hiking through the wilderness are some of the highlights that await you in New York State. 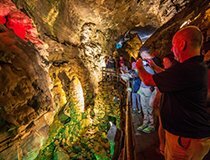 Not only that, New York State has many fantastic art galleries and unique attractions for those who visit. 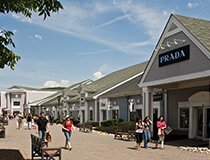 From the world famous Woodbury Common Premium Outlets to the many antique stores, New York State is a treasure for those who love to shop. Being the home of Buffalo chicken wings, world-class craft beer trails and fantastic fresh seafood restaurants, you’ll be spoilt for choice in New York State. One of the great things about New York State is that it’s a fantastic destination to visit, no matter the season! In the Winter, you can enjoy exciting activities such as skiing and snowshoeing or if you prefer to relax, just take in the stunning winter scenery as you sip a hot coco. Spring in New York State brings lots of festivals and it’s also a popular time for those who love to hike. 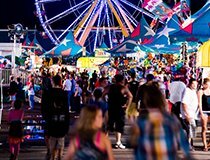 Summer time is all about the seaside in New York and it’s also a very popular time for families to visit. Fall is the most popular season for those who love to feel a light chill in the air as they enjoy the stunning fall foliage. New York State has never been more accessible with the new direct Norwegian Air service from Ireland. If you’re planning a fly/drive holiday and you’d like to try a new destination, add New York State to your bucket list. For more information, contact our Travel Experts on 01-8173535 or via the contact form below.